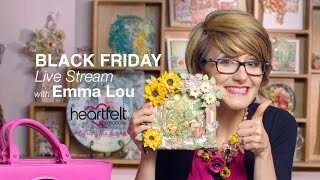 Create memorable one of a kind handmade cards to gift friends and loved ones using these unique and creative foldout or shadowbox card bases! Fancy fold cards are now easily achieved without the extra fuss of measuring, scoring and figuring out how the pieces fit together! With these easy to use premade card bases, simply fold along the scored lines and set about to the fun part of decorating! Included in each packet are three card bases, two with varying styles of foldouts and one shadowbox base! All are ideal for creating dimensional or scenic one of a kind handmade cards. Choose from two portrait base designs featuring unique contoured cuts and foldouts, as well as one shadowbox design. We recommend purchasing the complementing Delicate Border Basic Die, Classic Border Basic Die, Fleur Border Basics Die, and Elegant Border Basics Die, along with your favorite Heartfelt Creations Collection to embellish and create your very special one of a kind creation!